Superstar Mahesh Babu’s silver jubilee film Maharshi teaser launch will be held this Ugadi. The date and time is set for Maharshi teaser at 9:09 AM on April 6, as the film's director Vamsi Paidipally announced the news unveiling a new poster. The poster had a silhouetted Mahesh Babu looking at the New York’s iconic Empire State Building. The film shows Super Star as a New York-based businessman, while Pooja Hegde is the lead lady. Allari Naresh is playing a crucial role in the movie. Dil Raju, Ashwini Dutt and PVP Prasad are jointly producing the movie on PVP Cinemas banner. Devi Sri Prasad is the music director. 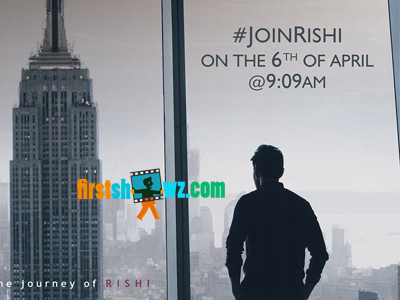 Maharshi is announced for a grand scale release on May 9. The shoot schedules are nearing completion and it is left with a couple of songs. One among these songs will be canned in a special set erected in the Annapurna Studios of Hyderabad. Mahesh Babu and Pooja Hegde will be partaking in the shoot.